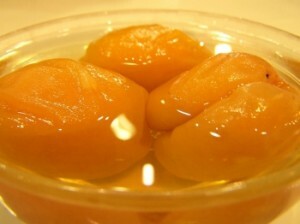 Soak apricots in water overnight. Simmer in same liquid for 30 minutes in a saucepan. Add sugar. Stir slowly until sugar is dissolved. Simmer for 5 minutes. Remove from heat. Cool. Serve chilled in individual bowls or cups.